See the moment Army Staff Sgt. Ronald Shurer II, a former Special Forces medic, receives the Medal of Honor for saving his teammates' lives. The men of Operational Detachment-Alpha 3336 knew it was going to be a harrowing day before they ever set foot in the Shok Valley on April 6, 2008, on a mission in Afghanistan’s remote, and at times impenetrable, Nuristan province to capture a high-value target with the Hezebela Islami Gulbadin insurgent group. It was cold, there was snow on the ground, the drop zone was a raging river, and as the helicopter sliced through cloud cover, it became clear to the Green Berets that there were more threats in the mountains above than they had accounted for. “There were hundreds and hundreds more compounds than we were able to see from our imagery,” Lt. Col. Kyle Walton, then a captain and the ODA commander, told Army Times in a Sunday interview. The terrain was too steep and jagged to land the CH-47 Chinook, so the men braced themselves for a 10-foot drop from the hovering bird into the river. “We were all just kind of struck by the quiet in the valley,” former Staff Sgt. Ronald Shurer II told reporters during a round table on Sunday, joined by Walton and two other soldiers who survived the six-hour battle. The men all received Silver Stars for their actions. On Monday, Shurer, the team’s senior medical sergeant, will see that award upgraded to a Medal of Honor, the nation’s highest award for valor, in a ceremony at the White House. Their mission was clear, if not daunting: Hike up the near-vertical 60-foot face of a mountain and capture a guy who was supposed to be in a compound at the top of it. But it’s usually in vehicles with large, mounted weapons, he added, and they weren’t usually assaulting up a mountain to reach a village. They knew that if something kicked off, it would get ugly quickly. But it was not to be. Within minutes of their landing, Shurer said, they saw two Afghan men scramble up a hill. “We felt like everything just opened up on us,” Shurer said. Insurgents let loose sniper, machine gun and rocket-propelled grenade fire from multiple positions in the peaks above. “You could feel a sense of escalating, even from the guys in the aircraft radioing down, guys on the ground running around with RPGs,” Behr told reporters. Within minutes, he was shot in the leg, in danger of bleeding out. 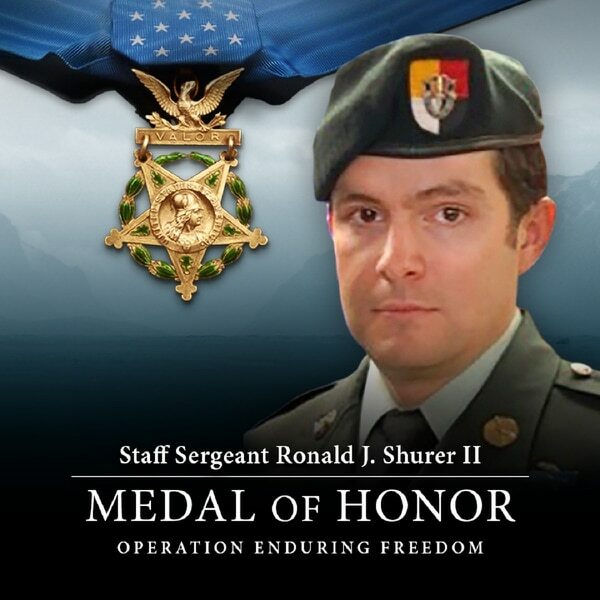 "I heard the calls for ‘Ron!’ " Shurer recalled, as American soldiers and Afghan commandos went down. An Army Special Forces soldier will receive the Medal of Honor for fighting through an enemy ambush and saving his teammates' lives 10 years ago in Afghanistan. The medic bolted to Behr’s side and removed his own helmet, he said, so he could get a better assessment of the soldier’s injuries without rolling him over and further damaging his hip. Shurer packed Behr’s wounds with a clotting agent, he said, at one point jamming his fingers into the wound in an attempt to stop the bleeding. His helmet back securely on his head, Shurer continued to work on Behr. At some point, they recalled, a bullet ripped through the arm of another soldier before slamming into Shurer’s helmet ― like being hit with a baseball bat, he said. Stabilized, but in a morphine haze, Behr felt that he might be in his last moments, and it was time to pray. "I said, ‘Hey, I don’t know that I’ve been the best person in the world, and I don’t know that I have any reason to stay alive, but if there is a reason for me, make it so,’ " Behr said. "And Ron slapped me across the face and said, ‘Wake up! You’re not going to die today.’ "
“Ron’s presence in that time and being able to keep calm and cool and collected while administering to my injuries is the only reason that I’m alive today,” Behr added. Shurer was concentrating on maintaining the stabilized wounded from his own element when a call came over the radio from Walton’s command team. They had made it to the top of the mountain but were struggling to hold their ground, pinned down with no cover just as they approached the first building in the compound. Under fire, Shurer scrambled up the hill. “The entire time we were up there, you could still feel those bullets go by, you could still feel the dirt kicking up,” he said. As he worked on the wounded, four soldiers and 10 Afghan commandos, the firefight raged on. “We were trapped with our backs to a 100-foot cliff, surrounded by our wounded comrades, calling in danger close air strikes nearly on top of us, to give those wounded guys a fighting shot at surviving,” Walton said. At one point, he said, he began to lose hope. With medevacs on the way, the team had to devise a way to get the wounded back down the hill to a clear area for their exfiltration. “I remember saying, ‘Broken arms, broken legs and broken backs are fine.’ We just need to find a route where they will live,” Walton said. Using some nylon webbing they carried with their supplies, Shurer managed to lower casualties down the mountain. With the casualties safely on their way, the ODA regrouped to figure out the next steps. But the weather was bad and the day had been eaten up by the firefight. “They had said, basically, leave now or we don’t know when you’re going to leave,” Shurer said. Once safely back to Jalalabad, he said, he went to check on some of his wounded teammates, then gave his family a call. “Not to tell them about the mission, but just to tell that that I was okay,” he said. 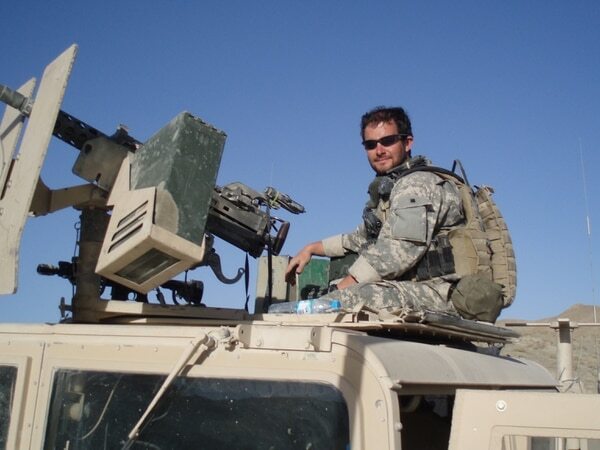 Shurer received the Silver Star for his actions in combat, and by the following year, he had left the Army and joined the Secret Service, where he has served since 2011. “It’s hard because I was there, but it really is the kind of story that they make movies and write books about,” Behr said.